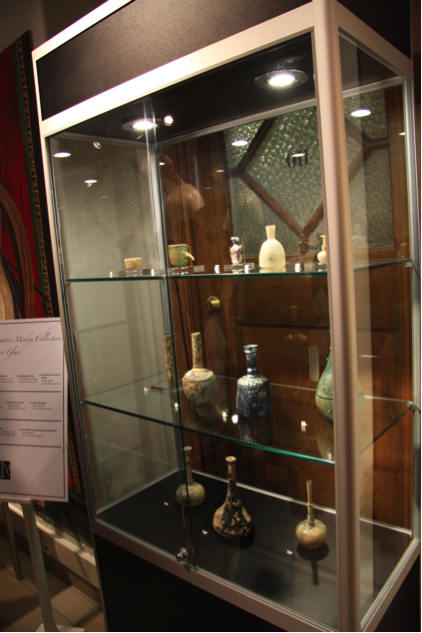 In 2012 the Museum unveiled the Minden Collection of Ancient Glass and Other Artifacts. The collection consists of fifty-five pieces of original ancient glass, ten strings of ancient beads, eleven pieces of original ancient earthenware and one faience ushabti. 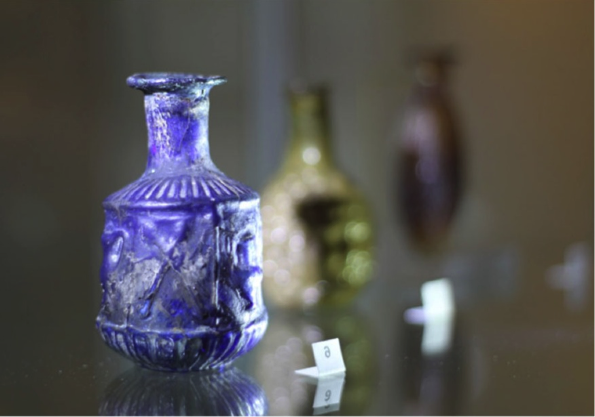 The Minden collection is distinctive because of the variety of objects within the collection and the quantity of intact glass vessels that are a part of it. The Museum now boasts one of the largest ancient glass collections in western Canada. The earthenware extends over a longer range of dates, from the 18th century BCE to the 7th century and includes: four oil lamps, five pottery vessels/fragments, and two figurines. The pieces originate from the same areas as the glass. This part of the collection was researched by a small group of the Museum volunteers, to confirm their provenience as well as giving detailed descriptions of the pieces and their contexts. Islamic glass. "Wide Islamic Bottle" featured on the bottom shelf in the middle. Research and writing is close to completion in order to create an official publication of the entire Minden collection. 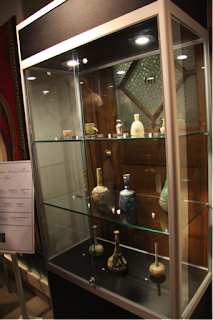 It will include the ancient glass vessels, beads, and the earthenware with overviews of each time period and style. The research that has been done has lead to some fantastic new discoveries. 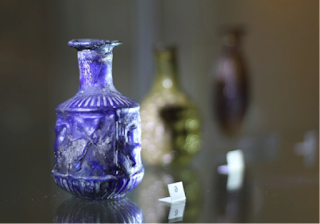 One of the interesting discoveries showed that the vessel known as “Wide Islamic Bottle” was found to be from a late Islamic period, between the 16th and 17th centuries CE, whereas it was originally thought to be from the 7th to 9th centuries CE, almost a thousand years earlier. This was found through stylistic comparison through an Islamic glass catalogue, and more excitingly, through a painting by Muhammad Zaman in the 17th century CE. Our fifth interview done in this series was with Lindsay Goodwin, who is a member of the Saskatoon Historical Fencing Society. Having sent Lindsay a list of questions she sent me back her answers to help us at the Museum, and the wider community, understand better what her group is all about. Q: Thank you for taking the time to answer these questions Lindsay. The first thing I would like to know is what your position within your group is and how long have you been involved? A: All of the club members are fighters first and foremost. Together we are a community of fighters who share teaching positions within the club. This encourages our members to learn firsthand from our resources and share ideas with the group in a community learning environment. I became involved with the group in 2012, when I stumbled upon their poster in one of the University of Saskatchewan hallways. I went to one of their meetings and instantly fell in love. Q: That is fantastic! What inspired you to join the group after attending that first meeting and what is your favourite part of being involved in your group? A: I have always had an appreciation for martial arts. Fencing gives me an opportunity to participate in a martial art, as well as shamelessly loving the medieval lifestyle. It’s also really great exercise, which is an added bonus. My favourite part is the sense of community I feel when the club meets and we all share our interest in learning and practicing these techniques. We all get along and are here to improve one another’s skills. Q: I can definitely relate to the appeal of learning a different type of martial art that you don’t always find being taught in other places. Do you find you gain more insight into the medieval groups that you are learning the fighting styles of? If so, could you please describe an aspect of it? A: Because our club covers a great scope of time periods we see how weapons and combat change along with the world around it. Most of our manuals are written with a particular environment in mind which reveals a great deal about how and why people employed the weapons and techniques that they did. Q: That is extremely interesting, especially that you have enough information to recreate their techniques. Now this was the Historical Fencing Society’s second year participating the Museum’s festival. 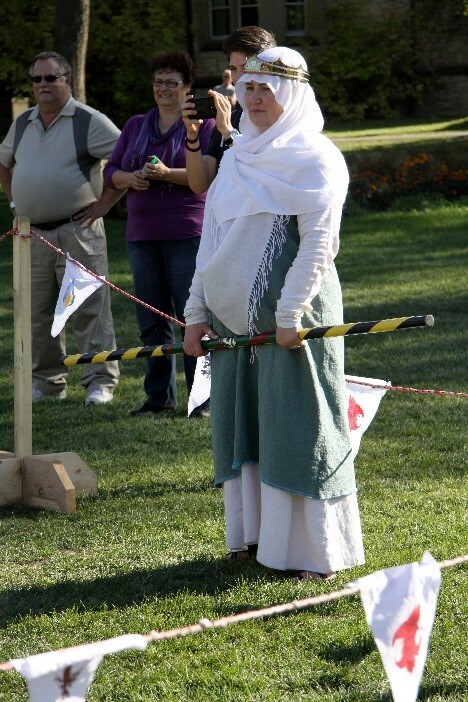 What would you say is your favourite part about being involved with the medieval festival? What would you like to see in the festival’s future? A: The Museum has really supported us as a University club, and we are more than happy to return the favour. It’s a great opportunity for the club to demonstrate its knowledge and skill, to meet others interested in this art, and to interact with the public. Personally, I am just glad to share with others all that I have learned from medieval sword-fighting. For future festivals, it would be interesting to see a little cross club competition, since we are a fight oriented club. Additionally, we would also like to see this festival evolve to the state where we could have a medieval feast (we love to eat!). Q: That sounds awesome, a medieval feast is definitely an experience that would be great for community members to enjoy, and is something that the Museum has been thinking about trying to take on. For my last question, is there anything that you see in your group’s future that you are excited about? A: Hopefully we can get to a more competitive level and see the rest of the historical fencing community grow as well. More people getting involved is an exciting prospect, as new fencers only make the community better and stronger. Q: Thank you for taking the time to answer these questions Lindsay! Our fourth interview was done with the Executive Director of the Saskatchewan Archaeological Society Dr. Tomasin Playford. Q: Thank you for taking the time to answer these questions Tomasin, we were very happy that you could join our event this year. Could you tell me a little bit about the Saskatchewan Archaeological Society and what it does? A: Well it’s a membership based society, and what we do is we bring together people interested in archaeology and we have been around for over 50 years. We celebrated our 50th anniversary in 2013 and the society grew out of collectors that were going out on the landscape that came together wanting to learn more about the artifacts that they were finding. We offer about 20 different programs and services. So we have things that we do for our members and the general public: we publish a quarterly and occasional papers, we do an annual gathering and general meeting every year, bus tours, workshops, and we also have a library. One of our most popular activities in a public field school which we offer every summer. The SAS also does conservation work, which includes the identification and recording of archaeological sites, and providing educational programs as well, such as guidelines for visiting archaeological sites. We have a core group of volunteers that are part of the SAS but we are always looking for volunteers to help with individual projects. Q: Well that’s really cool! Does the society operate year round? A: Yes, our office hours are generally Monday to Thursday 9:00am to 4:00pm or Friday by appointment so there is often someone in the office. We might be out in the field doing work or running errands, so I always recommend that people call first just to make sure we’re there. Q: That’s great! It is definitely important for the public to have the opportunity to get involved and learn about archaeology. How long have you been involved in the society and what inspired you to pursue the Saskatchewan Archaeological Society? A: I have been the Executive Director for just over 2 years but I have been a member for about a dozen years now. I was a graduate student at the University of Saskatchewan but I didn’t really get connected with my provincial organization until I moved away unfortunately. So my motivation when I was a student was to learn more about Saskatchewan archaeology. When I moved away it was a bit more to support the Society, so I think that if I could speak to other people’s motivations, they are all different. Students connect because they wanted to network, we give out bursaries, there are teachers that join because they want to use our resources, and we have members that have been involved as collectors, so there are many different motivating factors that attract different people. Q: That’s fantastic that there is such a wide variety of people involved with the society. Do you find that you gain insight into the groups that lived, and in fact still live, in Saskatchewan through Plains Archaeology? A: Oh yes, about 90% of the archaeology that we do in Saskatchewan is First Nations Pre-Contact Archaeology, so we are increasing our connections with First Nations and Metis peoples in terms of their archaeology. There is a vast amount of information held by the First Nations and Metis, but we must keep in mind that we need to be respectful and understand that it doesn’t always have to be shared with the general public. Q: That is a great point and something I definitely think that everyone needs to remember! My next question for you is what is your favorite thing about being a part of the Saskatchewan Archaeological Society? A: My favorite part it is that it is my dream job, and is one of the best archaeological jobs that I could have asked for. I get to go talk to people about archaeology, and it’s different every day. It’s definitely about the people, we have a great membership, but we also get to bring archaeology to people who don’t know about it or understand it. We also get access to unique artifacts that not everybody necessarily gets to see in Saskatchewan. It’s also about learning for me, that we get the chance to learn about all aspects that archaeology encompasses in Saskatchewan. One of our most popular programs is the field school. It’s not actually that common in Canada for there to be public archaeology, Wanuskewin is actually the longest running public archaeological program in Canada. Q: That is awesome! What you have described is something that has always been attractive to me about archaeology. It’s not only about the chance to learn from archaeology but to share that knowledge with others. Is there anything in the Saskatchewan Archaeological Society’s future that you are excited about? A: Well actually, as a provincial group we are organized into chapters, and the Saskatoon Archaeological Society is celebrating their 80th anniversary this year the same weekend as Culture Days. Most of what we do for archaeology is in the summer. We also published our third occasional papers in archaeology on the Cypress Hills Massacre at the Fort Walsh area, so you should look for that in your local bookstore. Q: I definitely will! That would be an interesting read. Now for my last question, what motivated you to approach the Museum of Antiquities to become part of our festival? A: I approached the Museum because I had attended it the year before with my nieces and nephews. I was really excited because we had did our Culture Days event on the Friday so that we could have a chance to attend the other events throughout the weekend. I was really excited for this event because of the diversity of activities that were made available, which is something that attracted me to attend the event as a participant and that they were so kid friendly. I thought it would be a great opportunity for the kids, both boys and girls which ranged in age from 5 to 12 years old, and there was something for everyone. I also thought it would be neat to make that relationship between the New World and Old World here in Saskatchewan. We were also interested in coming to this event because of the exposure. There were so many people that participated last year and we saw a better opportunity to showcase what the Saskatchewan Archaeological Society has to offer to the public than what we could have done on our own. Q: Yes we are very excited that we can make that connection between New World and Old World this year. Part of our mandate for the event is to offer exposure to different cultures that still affect the present day Saskatoon community and helping them understand them equally. I want to thank for taking the time to answer these questions. 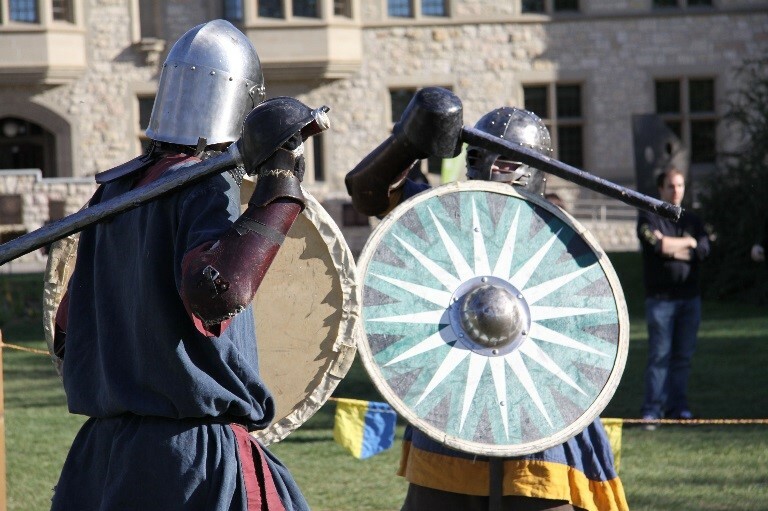 We know the SAS has a lot to offer the Prairie Paladin Medieval Market and Faire and that it will be a hit with the community! Our third interview was done with Dezz Windecker-Klassen from the Society for Creative Anachronism Barony of Myrgan Wood. 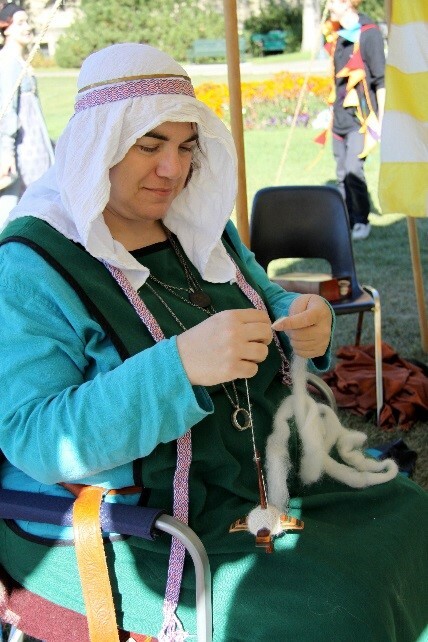 She is the current interm Seneschal (president) of the local SCA chapter and has been working with the Museum on the Prairie Paladin Medieval Market and Faire since the very beginning. Q: Thank you for taking the time to answer these questions Dezz. The first thing I would like to know is what you do for your day time job, what your position within the SCA is and how long you have been involved? A: During the day I am an office manager and family law paralegal for a law firm in Saskatoon. My current position within the SCA is interm Seneschal (president) and I have been playing for 18 years. Q: That is fantastic to see the commitment you have to the SCA not only by being involved for so many years, but to also take on a larger leadership role within the group. What inspired you to join the SCA and what is your motivation to continue volunteering your time? A: I wanted to meet new people and explore the medieval history surrounding my family’s origins. My motivation to volunteer in my group is the joy I see when people enjoy the benefits of that work. The best time to see the results of my efforts is when you take a moment in the middle of an event and just watch and everybody is enjoying themselves. When it comes to our demonstrations it is the smiles, laughter and general excitement of the crowd. Q: I definitely relate to that type of motivation and how inspiring it can truly be. Do you find you gain more insight into the different groups of the time periods you reenact and study? Could you please describe for me an aspect of it? A: This is dependent on how much research you determine to do as it relates to a time period you want to replicate. As well, it is truly hard to know the life as there are aspects that cannot be replicated. Q: That is great that you allow members to do as much (or little) as they want to in respect of the research they want to do. What is your favorite part of being involved with the SCA and what do you see in its future? A: I don’t have one favorite but multiple. I enjoy running/organizing events for our members to enjoy and my other favorite was when I was Baroness and the ability I had to present individuals with awards to show how much their skills and service are appreciated. I see growth in our group as it pertains to members and the growth of our youth armoured combatants. Q: Wow that is really cool! I definitely see myself being a part of the SCA one day, which may not be in the near future, but definitely one day. Now for my final questions. What is your favorite part of being involved with the Museum’s medieval festival and what would you like to see in the festival’s future? A: My favorite part of the festival is watching the children as they see our armoured members fight in combat. We would like to see other organizations become involved with the festival that assist with activities that visitors can be interactive in. Q: That is great, we are definitely trying to accomplish having more groups become involved with the festival to make it bigger, better and have more things for the community to learn about and enjoy. Thank you Dezz for taking your time to answer these questions, I know there are lots of people who would be interested in what your group has to offer. Our second spotlight interview of the Prairie Paladin Medieval Market and Faire series is with Luthier Weldon Gray. 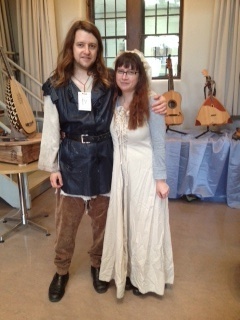 This is Weldon’s third year volunteering at the Museum’s medieval festival and he has been involved with the Museum since 2013 when the Museum curated an exhibit of his instruments known as Euphonia: Music for the Masses in the Middle Ages. 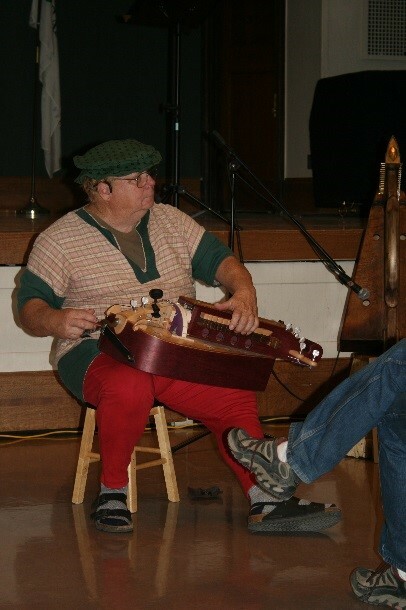 His musical performances are enjoyed by all ages at the festival, and this year he is bringing with him an exciting new addition: Miz Weaver & the Ragamuffins, a youth choir that performs medieval music. It was my pleasure to sit down with Weldon to discuss the work that he does. Q: Thank you Weldon for coming and doing this interview, I am excited to share all the things that you do. The first thing I would like to know is what do you do when you are not making instruments or performing, what motivates you to volunteer your time for the Museum festival? A: I spend the majority of my days being a magician known as the Wacky Wizard, doing performances for groups. Otherwise, I am designing and building instruments. I volunteer my time for the Museum’s festival because you guys are so nice to me. Q: That is awesome! We enjoy having you as part of our Museum community, so I am glad that you enjoy it as well. Now, what inspired you to become a luthier? A: Building instruments started off as a hobby. I went to go buy a lute, as I was a member of the SCA (Society for Creative Anachronism) but you can’t buy them, so I made one. The research and everything that goes with building instruments was so much fun that I just got hooked. Q: So you took a little bit of inspiration and ran with it? A: Yeah, you’re building something and you are wondering what it is going to sound like and you don’t get to find out until it is done, and even then you don’t know if it is right or not, but hopefully very close since the thing you’re making probably hasn’t made a sound for 500 years. Q: Wow that is very inspiring! 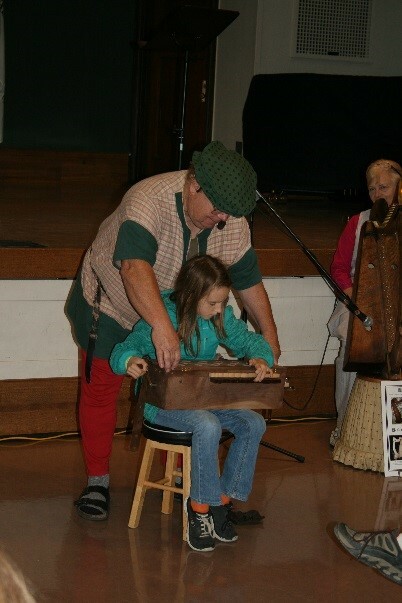 Do you feel like you are gaining more insight and interacting more closely with the history of the instruments as you go through all the steps needed to make an instrument? A: Yes, it makes you feel like you are living the history. All my electric tools though, I am sure they didn’t have that! But when you look at the pictographs and stuff of luthiers shops, and I don’t know if you have seen anything like that on the internet, but they have lathes that run off big mill stones with some poor guy out there turning them, which powers the lathe. And when you start seeing all kinds of pictures like that your mind goes nuts. Q: That is very fascinating and I will be checking that out later! It is cool to see how technology has progressed from the Middle Ages to the present day. So, if you could choose a favourite part of what you do, whether it is playing the instruments or making them, what would it be? A: Making them definitely, or discovering the next one. Whenever anyone asks me what my favourite is, it is either the one I am making or the next one that I will be starting on. Even when I am focusing on making one specific instrument, my mind is usually on the next one. A: I would say talking to people about it after the show when people come up with questions. Q: That is great as one of the things that you are here to do is to help educate people on instruments and music that they may know little, or even nothing, about. A: Yes it is amazing how little people know about this. For instance, I made an oud and assumed everyone in the Middle East (from where it originated) knew what it was. However, with all of the religious and political strife occurring at the moment, they have forgotten parts of their own history. I ended up talking to some people who were basically refugees from Iran and Iraq, so I brought out the oud, which they had in fact heard about it, but they have never seen one, which really shocked me. Q: Wow, that is really incredible, but it’s good that you were able to share that with them! Now, to switch topics for a moment, what do you see in your future as a luthier? A: Honestly, I don’t really think about the future, except for my next project which is a Prima Balalaika. I sold my last one and have been kicking myself ever since. I only build one instrument at a time, and cannot concentrate on anything else until that one is finished. Q: Well I am excited to see and hear your newest instrument once it’s complete! I also know that you currently have a museum in your house, known to us as the Medieval Instrument Museum to display all of the instruments you have made and still have. How many instruments would you say you have built, whether it be for yourself or for others that have instruments commissioned? 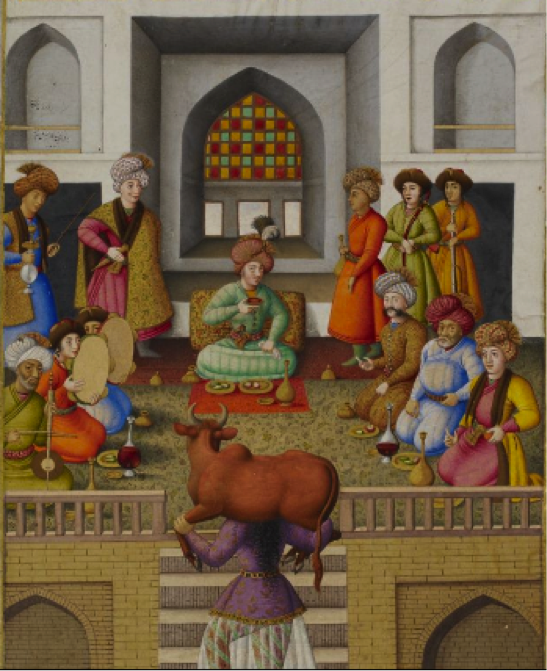 A: Yes, I designed my museum to display my instruments for family and friends to come and enjoy them. And I don’t know how many I have made in total, as I receive a number of commissions, but I do know that I have sold at least 20 and have another 20 instruments displayed in my house. Alice, my wife, says that building instruments started as a hobby but became an obsession, as can be seen by our own collection of instruments. Q: Well I would like to say that having seen most of the instruments that you have made, I am very impressed that it only started as a hobby! And for my final question, I would like to know if there is anything else that you are looking forward to for the festival. 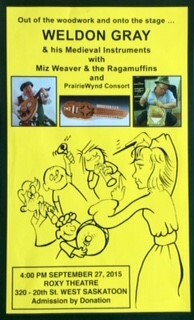 A: Well it will be interesting as this is my new group’s debut performance, Miz Weaver & the Ragamuffins’. Miz Weaver teaches her music students medieval music, and actually was at the Euphonia reception where I first performed for the Museum of Antiquities. A few years later she came to talk to me about medieval music, and it seemed to click, as she has so many great ideas and I have so many instruments. Q: Well I am excited for all of your performances! They have always been popular with the community members that attend the festival. Thank you for taking time out of your day to meet with me and discuss what you do. 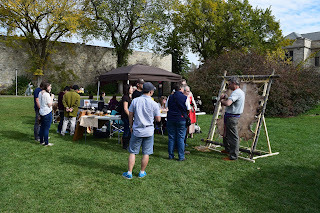 With the Prairie Paladin Medieval Market and Faire fast approaching, the staff and volunteers of the Museum of Antiquities would like to acknowledge some of the groups that have made the medieval festival wildly successful. Throughout the coming weeks before the festival, the Museum will be posting interviews done with these groups, allowing our readers to understand better the different parts of the festival. Our first interview was with Diane Davis, the Demo Coordinator for the Saskatoon Scottish Country Dancers. Having sent Diane a list of questions she sent me back her answers to help us at the Museum, and the wider community, understand better what her group is all about. Q: Thank you for taking the time to answer these questions Diane. The first thing I would like to know is what your position within your group is and how long have you been involved? A: I am the Demo Coordinator for the Saskatoon Scottish Country Dance Demonstration Team and have been dancing with the Saskatoon club for 5 years. Prior to that I danced in New Zealand for 15 years. The group is part of an international organization with clubs all over the world. Q: That is fantastic! 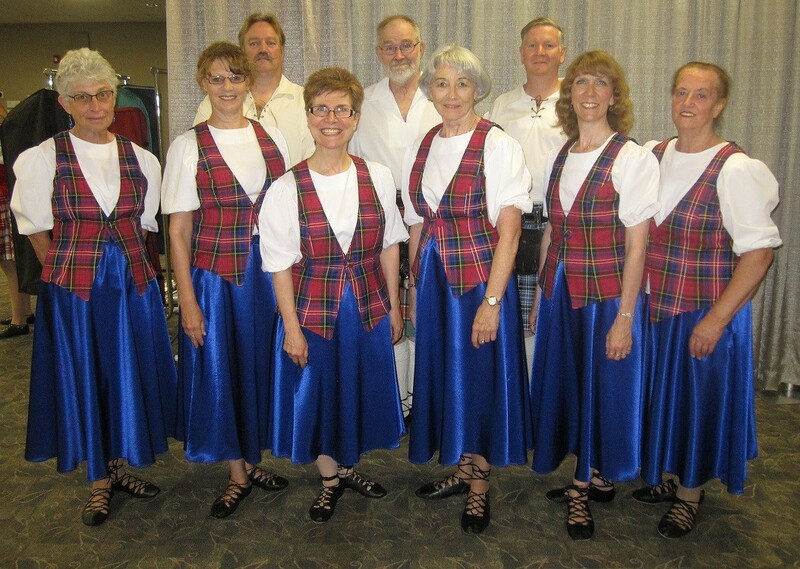 What inspired you to join the Scottish Country Dancers, both in New Zealand and in Saskatoon? A: I originally started dancing in New Zealand as a social outlet and for an activity that would keep me fit. I was a total beginner and was very much encouraged by the club members. All clubs provide trained teachers to help in the process of learning steps and patterns. What is exceptional is that in any clubs that I have been a part of, all members are very kind and patient in helping beginner dancers to feel confident. I discovered in the process that I really enjoyed dancing, so when I came to Saskatoon, one of the first things I did was look for a Scottish Country Dance club. It also provided me with a way to meet new people when I was a newcomer. I have to say I was welcomed with open arms and I have never looked back. Q: What a journey you have been on! It is amazing that you were able to find another club within this international organization that welcomed you so warmly that you decided to become the Demo Coordinator for Saskatoon’s club, which leads me to my next question: what is your day time job and what motivates you to volunteer your time to the club? A: I am mostly retired but I’m currently working as an office temp from time to time. 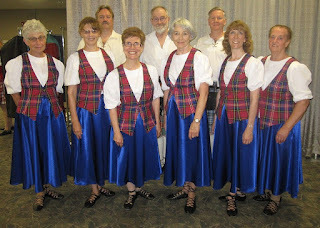 As a volunteer, I dance with the Scottish Country Dance Club and with the Demo Team because I love to dance. I believe that is true for the whole Demo team. It also provides a social network of like-minded people from all walks of life. The Demo team in particular hopes to demonstrate that anyone can join and learn. We have qualified teachers to help the beginners, as I have already described. We especially want to show how much fun it is and to promote Scottish Country Dancing as an enjoyable and social way to keep fit and to meet new people. Q: The motivation of being around like-minded people, combined with doing something that you are very passionate for, is something that I find is a common trait of community members like yourself who strive to help and encourage people to pursue their passion. This is one of the reasons why we, at the Museum, are glad that you have decided to be part of our Prairie Paladin Medieval Market and Faire, as you bring both your passion for dance and your dance-style’s history onto the stage. Do you find that you gain more insight and become more connected to the history of Scottish country dancing? If so, could you please describe an aspect of that insight? A: When we learn dances, we always hear the origin of the dance and perhaps the idea that sparked the dance in the first place. Often dances have been written for a person or event or particular place. For the medieval festival in particular, we look at the oldest dances in our Scottish heritage and learn how the old dances differed from today. It makes an interesting contrast to newer devised dances. Sometimes the style of fashions in the day dictated why certain moves were made. For instance, because ladies in the very early days wore court shoes, they couldn’t bend their toes very much so we curtsey to accommodate a flat soled shoe. Q: How fascinating! It is great to see how the historical impact on the Scottish dance style is still understood today and can be shared with those who know very little, if any, about it. One of our goal’s for this medieval festival is to show how the past still impacts the present, and your group is a fantastic example of that. Now, I only have a few questions left, each with a two part answer. The first thing is out of all the amazing things you described, what is your favourite part of being involved with your group and what do you see in the Saskatoon’s Scottish Country Dance club’s future? A: The dancing is my favourite part!! Being on the demo team means I get to do more dancing. And of course our aim is to ensure that Scottish dancing is an ongoing activity for anyone who is interested. To this end, we have an open house on Wednesday September 9th at St. Marks Hall, 1406 8th Avenue North at 7:00 p.m. Anyone is welcome to come for a free night to try out Scottish Country Dancing. No partners are required and there is no age limit. We have a member still dancing in his nineties. Q: I was able to see your group perform at the Scottish pavilion at Folkfest this year, and I definitely understand the appeal of dancing, as I used to do multiple dance styles myself. And if the attention and cheering your group received at Folkfest shows anything, it’s that people have the same desire to keep their heritage alive. Now my final question for you is: what is your favourite part of being involved with the Museum’s medieval festival, and what would you like to see in its future? A: Being a part of the festival’s atmosphere and activities is great. Also, we do research into our oldest dances and have an opportunity to learn about and to do dances that are not done in clubs so much anymore. However it is developed and matures, I hope our Scottish Country Dance Demo Team will continue to be included in the festival’s plans. This will be the Scottish Country Dancing Demo Team’s second year participating in the festival, and the Museum is glad they are able to join us again in expanding the community’s knowledge and awareness of the impact our heritage has on us in the present and in the future. The Demo team will be performing at the festival twice in the afternoon, and trust me, it’s something you don’t want to miss! 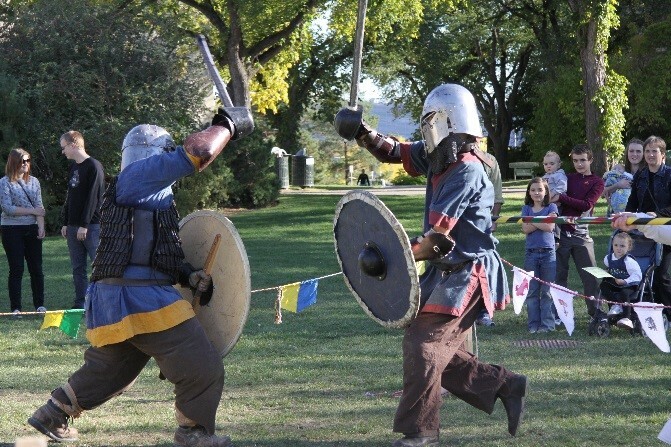 The Museum of Antiquities at the University of Saskatchewan (U of S) will host its annual Prairie Paladin Medieval Market and Faire on Saturday, September 26th, 2015. As part of the national Culture Days initiative, the Museum of Antiquities is hosting its third annual medieval festival from 11:00 am to 5:00 pm in he Bowl and at Nobel Plaza on the U of S campus. The public will be able to enjoy combat demonstrations, a medieval market, musical and dance performances, games and children’s activities. The event will be run by Museum volunteers and community groups including the Society for Creative Anachronism, the Nordhere Viking Living History Re-Enactors, the Saskatoon Historical Fencing Society and the Saskatchewan Archaeological Society. 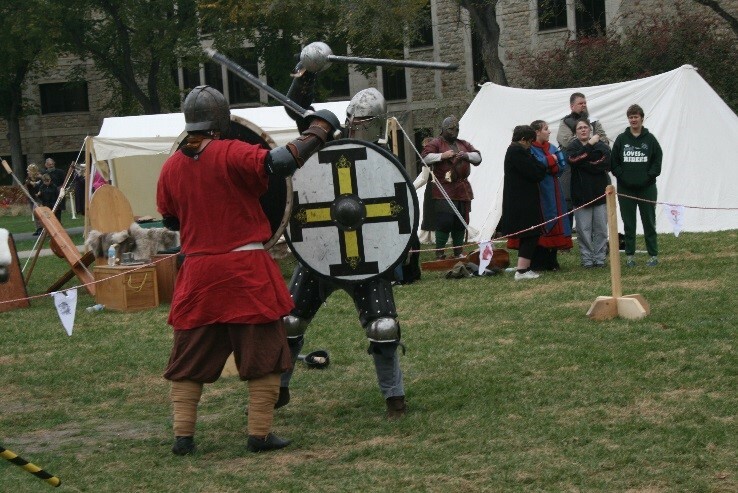 The museum’s previous festivals known as Weapons and Warriors and Return of the Kynge sparked an interest in the community, which led to the creation of The Prairie Paladin Medieval Market and Faire in 2014, which received more than 700 visitors. This family-friendly medieval festival is the only one of its kind in Saskatchewan, making it a unique experience for local community members who are unable to travel long distances to other medieval festivals in Canada and the United States. The museum’s goal is to create a medieval festival that will generate awareness of past cultures that still influence the world today, including not only medieval European culture, but also the First Nations cultures of Saskatchewan. The Museum of Antiquities, located in the Peter MacKinnon Building at the U of S, houses art work from the ancient Near East, Greece, Rome, and the medieval world. The museum’s collection contains both original artifacts and replicas.